Anu Garg's many readers await their A Word A Day rations hungrily. Now at last here's a feast for them and other verbivores. Eat up! ""A banquet of words! Feast and be nourished!"" "Anu Garg's many readers await their A Word A Day rations hungrily. Now at last here's a feast for them and other verbivores. Eat up!" "AWADies will be familiar with Anu Garg's refreshing approach to words: words are fun and they have fascinating histories. The people who use them have curious stories to tell too, and this collection incorporates some of the correspondence received by the editors at the AWAD site, from advice on how to outsmart your opponent in a duel (or even a truel) to a cluster of your favorite mondegreens." "A banquet of words! Feast and be nourished!" Written by the founder of the wildly popular A Word A Day Web site (www.wordsmith.org), this collection of unusual, obscure, and exotic English words will delight writers, scholars, crossword puzzlers, and word buffs of every ilk. The words are grouped in intriguing categories that range from "Portmanteaux" to "Words That Make the Spell-Checker Ineffective." 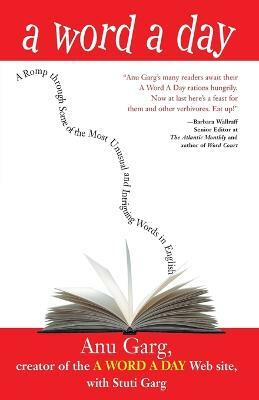 each entry includes a concise definition, etymology, and usage example-and many feature fascinating and hilarious commentaries by A Word A Day subscribers and the authors. Words to Describe People - I.
Lesser-Known Counterparts of Everyday Words. Words for Odds and Ends.